Hey guys. I tried to post this in an existing thread about Whiteline sway bars with no luck. SO I'm starting a new thread cuz I kinda need some help ASAP. 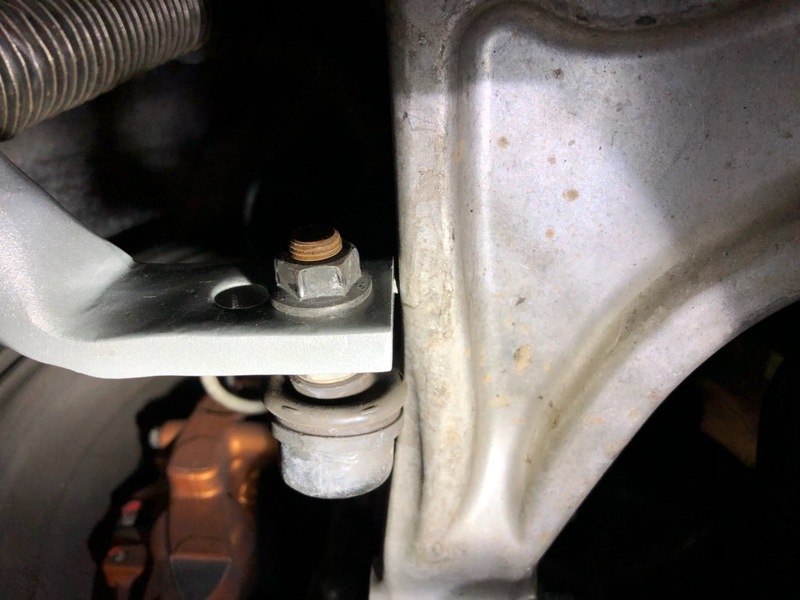 The first issue we ran into was the Stud on the Whiteline Front End Links Was NOT long enough to go thru the control arm mounting hole, and the Nut holding it link/stud in place was barely able to get 3 threads on. Pic attached. We reached out to Whiteline and they said they will forward info and pics to R&D department for more insight on it. The Second Issue we had was after opting to run the factory End Link with the Whiteline sway bar (front also). the Sway bar and end link are dangerously close to the LCA (lower control arm). Pics attached. This is with the car at rest on the alignment rack. So the suspension was loaded. and the position of everything is how it would be when driving. 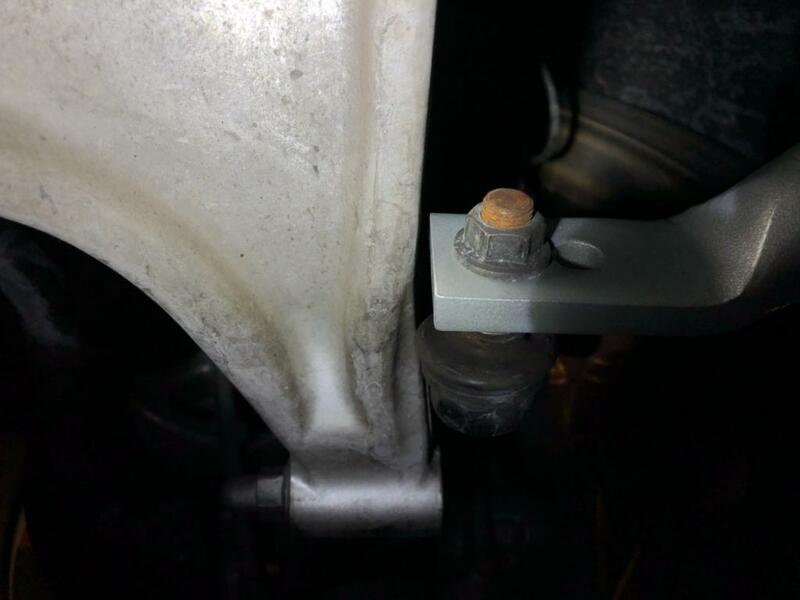 Need some insight from anyone who has installed this kit on their car and maybe a confirmation that something is not right here. OR that its normal and will be fine. What ever it is. I need help and info. Please. Edited by JZeezGTR, 07 February 2019 - 01:56 PM. Dang its an inch and 1/2 shorter then the OEM one. Something is up. Did you send them the pic of it being to short? I remember seeing an older post regarding a difference in CBA to DBA control arms and things were off about 1.5”. IIRC correctly Shawn was looking at doing a swap ? Is it possible they sent you one for a CBA? That seems like the most probable scenario. Did Whiteline ever make a revised version for the DBA's? This is the post that outlined some of the differences, but doesn’t look like it addresses your specific issues. Sorry. The geometry in the lower control arms is different by about 1 inch and then some. 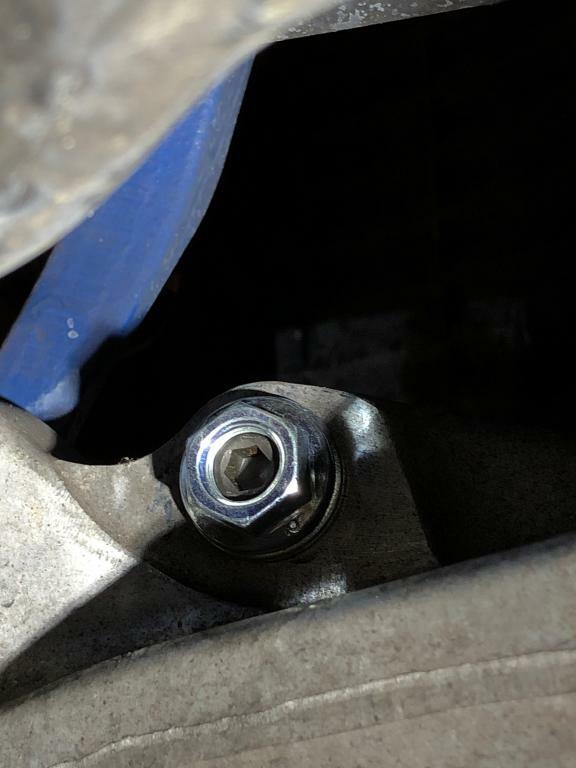 I do not know if this affected the mount for the swaybar. It did move the shockpoint mount significantly. I had a Whiteline swaybar, and it fit the 2009 perfectly. I still have it, if you need to compare. I've been in contact with Whiteline and Vivid Racing about this. and there doesn't seem to be a solution in sight. Turns out the factory bar on my car for some reason is longer than the Whiteline. AND its causing fitment issues. 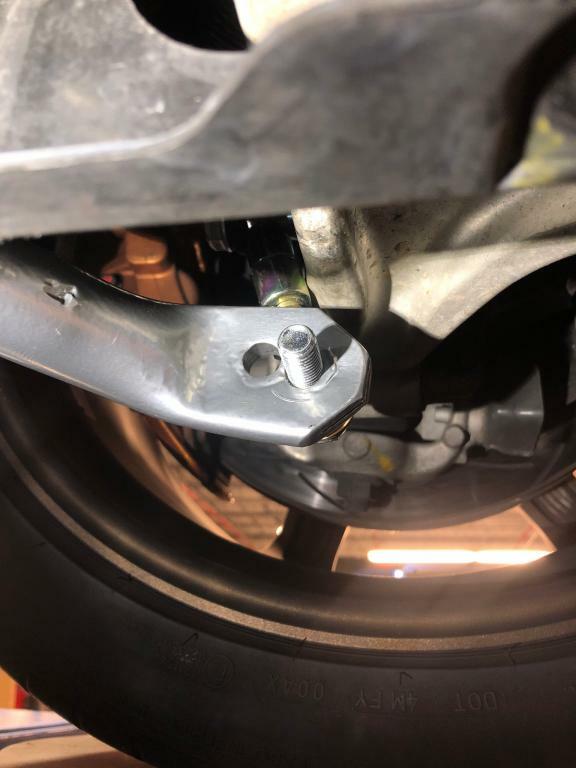 They did have a longer balljoint/stud to replace the shorter ones on the end link BUT that doesnt help if i cant even use the bar. SO, i'm working with Vivid Racing to return this kit and probably pick up the Stillen Kit that's 2x as expensive. FML. smh. Oh well. I asked the Eibach guys at the SEMA booth this year if the Eibach bars I have been running on my 2009 GT-R would fit on the 2019 GT-R I ordered and they said they didn't know as they had not had a GT-R in their shop for a long time. One of the guys said to try it and let them know! Now that's aftermarket engineering at its finest LoL. I guess I will find out. Does Whiteline say their bar is made to fit the newer model GT-R's? I have the same kit and it fit fine on my 2010 R35. 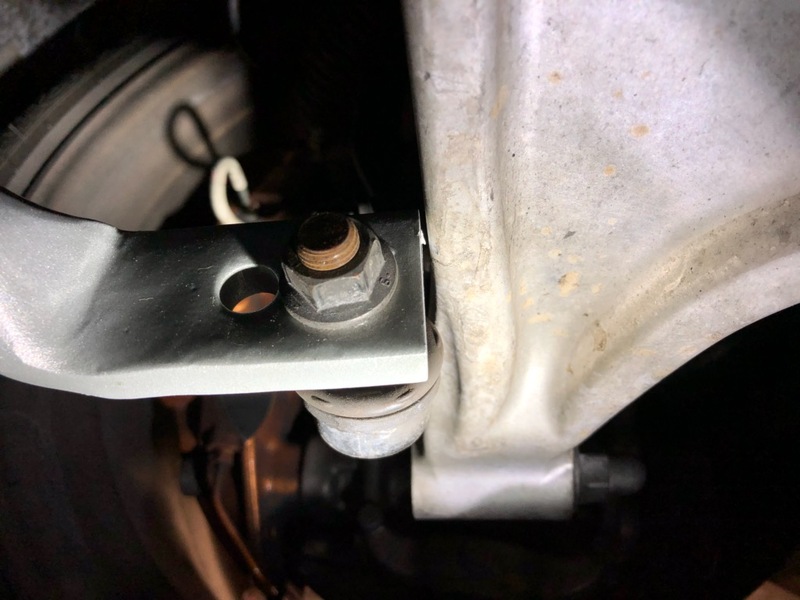 Initially, I measured the OEM sway bar against the Whiteline one and it was also an inch shorter. I am also using the Whiteline end links however. Several track days and it works fine with no issues. The only issue I have is that the 'greaseless' bushes are starting to squeal after 2 years. Picked up the Stillen kit to replace the Whiteline bars that had a problem with the front endlinks and bar. The new Stillen kit's front bar side by side with the Whiteline, and its a significant difference in size. 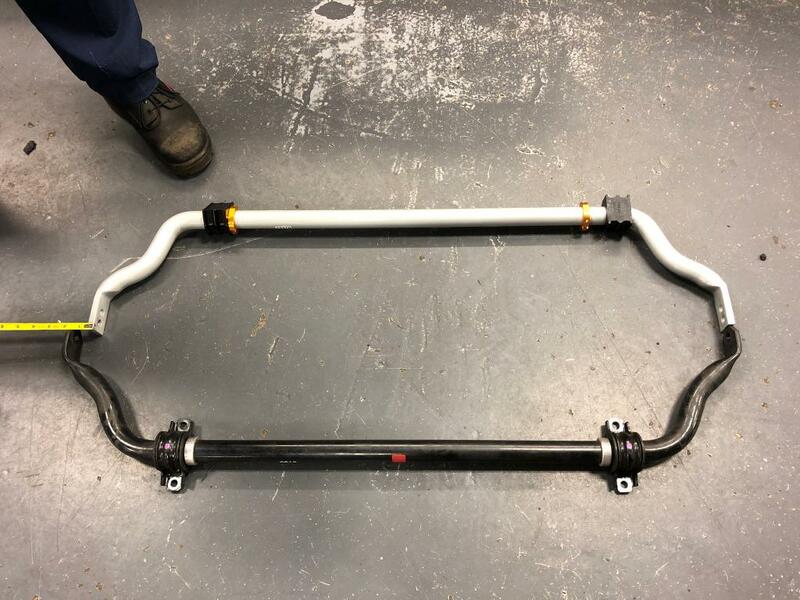 The Stillen is identical to my OEM bar in size (width from end to end) vs. the Whiteline bar. I will be installing the Stillen kit this weekend. and will update you guys on how it goes. Only gripe with the Stillen kit right from the start is the rear bar seems to be much thinner than the Whiteline rear bar. So i feel like it may not give me the added roll resistance in the rear that i want. but we'll see how the kit feels as a whole on the track once its on. I dont want to jump to conclusions and i have to remember they were probably designed in conjunction with each other and the car may be well balanced with the kit installed. We shall see. Everyone who's had the Stillen's has been happy with them. I was happy with OEM, and whiteline, and Forged Performance, I just thought the Forged Performance gave me the most rotation of the car - but that also takes out traction when the rear bar is big. Drive it before you decide. Ok. soo.. NOW i'm pissed!!! WTF is wrong with my car? Can this variation of lower control arms that everyone speaks of on the GTR, be so extreme that no aftermarket sway bars fit this model? I mean, 2 HUGE reputable brands dont fit on the front. Whiteline and now Stillen. See pics on how the stillen fits. i was confident with this one. but NOOOooooOOo.... not my luck. Edited by JZeezGTR, 13 March 2019 - 08:56 PM. Is it possible you have the mounting brackets on the frame reversed or wrong? I dont know. I never took them off before. are they removable? i thought they were welded to the subframe. Edited by elf_cruiser, 14 March 2019 - 09:59 PM. The loops that bolt to them are. I don't remember them being directional, but the could be. 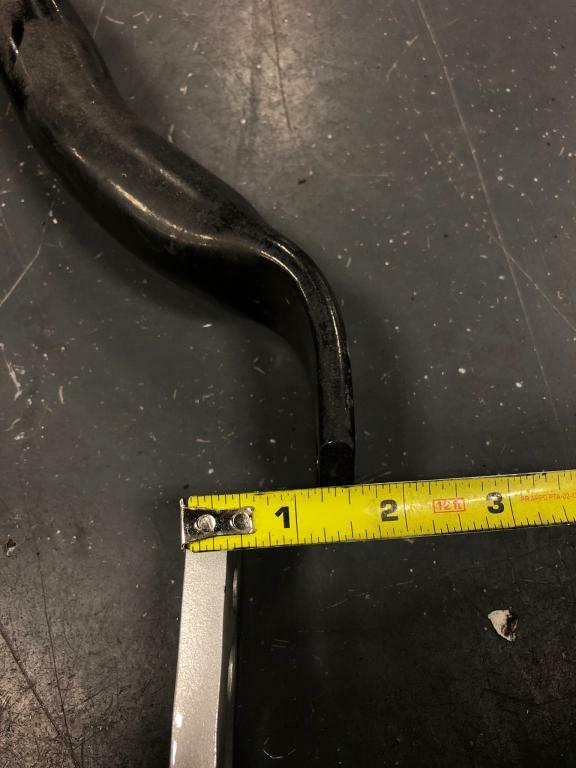 Could your subframe be bent? It looks to me like the ends of the bar are displaced posteriorly and inferiorly from the comparison to Stillen's pictures. That's something that could cause that. Car was purchased New and never in any accidents or any type of impact that may have caused the subframe to be bent. i dunno. but i'm gonna give the install a try myself this time and im gonna take Stillen's advice thru email to extend the end link as long as it can go. and they said it should move them away from the LCA far enough to be safe. they said its normal. and that they've sold thousands of kits with no issues. So i dunno what to expect but i'm gonna try again. But everything you show us is REALLY WEIRD. A shorter bar shouldn't pull the endlinks DOWN and BACK, which is where your bar is ending up. The shorter bar should pull it up and forward. Recommend: Reassemble OEM bar, and take pictures where those end up. If they end up in the right place, reassemble the new bar (Stillen/Whiteline) using the OEM endlinks. I'm just working this out in my head. I was under there a hundred times with three different bars, and I just can't work out how that bar is ending up THERE.